WAIST HIGH: Headstone Of Ian Curtis Stolen. Headstone Of Ian Curtis Stolen. "The widow of former Joy Division frontman Ian Curtis is in a 'state of disbelief and shock' after thieves stole the memorial stone from his grave." And a former band mate described the theft as "sick" and a "new low." 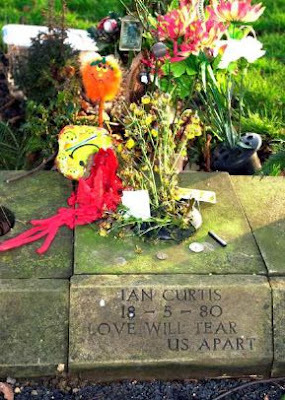 The headstone, which has the words Ian Curtis 18 - 5 - 80 and the iconic lyrics "Love Will Tear Us Apart" printed on it, was taken from Macclesfield Cemetery in Cheshire, England. Council staff believe the thieves went to great lengths to dig up the heavy stone and remove it from the site, which is some distance from an entrance to the 60-acre cemetery. Thousands of music fans have travelled from across the world to pay their respects at the grave of the iconic lead singer after his death in 1980. Curtis hanged himself in the kitchen of his home in Macclesfield. The band later reformed as New Order and enjoyed great success. The film Control, the acclaimed biographical film about Curtis, was released last year. Tony Barker, a spokesman for Macclesfield council, said Curtis's widow, Debbie, was informed of the theft as she returned from holiday. He said: "We had to break the news to Debbie and she was shocked and found it difficult to take in. She is in a state of disbelief and shock. Considering it has been there for over 20 years I think everyone is shocked and surprised this has happened. It remains baffling and leaves you asking who, what and why?" There has been added interest in the grave since the film was released last year. Former New Order drummer Stephen Morris said: "It's pretty disgusting really that it's been there for almost 30 years and somebody has decided to take it as a sick souvenir." Morris also said, "It's upsetting for Ian's relatives, as it would be for anybody, and I can't see what worth it's got to anyone. I think it's a little bit sick and what on earth they hope to achieve I don't know. We've all been wild and reckless in our time but surely this represents a new low." Insp. Gareth Woods, of Cheshire police said: "This is a very unusual crime and it's not the sort of thing we have encountered before." "Most Joy Division fans have respect for that area and we are appealing for information because we want to try and prick the conscience of anyone who knows anything about this." The theft took place between Tuesday afternoon and Wednesday morning and anyone with information is encouraged to contact Macclesfield police at (01625 610000).